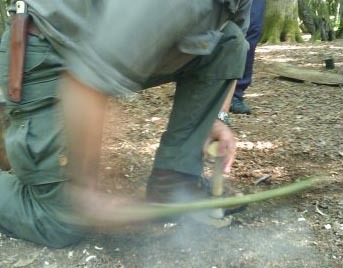 The author demonstrating the bow-drill method of friction fire-lighting. 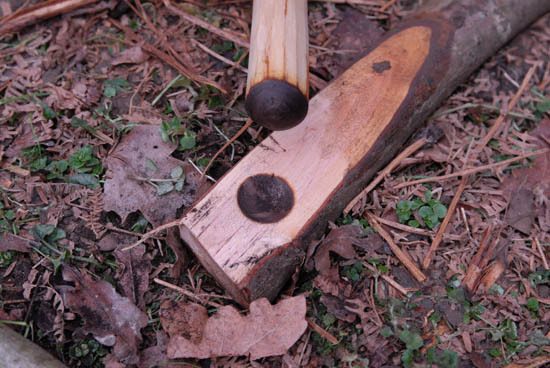 Friction fire-lighting is one of the defining skills of bushcraft. The ‘bow and drill’ or ‘bow-drill’ is the most widely applicable of the friction methods. Yet many people struggle with it, particularly while learning or during practice by themselves. Failure is OK when you are learning, while you are getting used to the posture, accustoming your muscles to the technique, experimenting with new materials. Failure is part of the process. What is important is you don’t give up. It is important to stay positive. This piece is not a complete beginners guide to bow-drill. It assumes you are already familiar with at least the idea of how a bow-drill set works. You’ll get more out of this article if you have already had a go at bow drill. Those who will get most out of this article are those who have not yet achieved consistency of application, yet are willing to put in the effort to do so. The main aim of this article is to help you eliminate the factors that contribute to failure. Whether you are practicing in your back yard or stranded in the middle of nowhere, wet, lost and without matches, everything you do in preparing and using a bow-drill set is aimed at achieving success and eliminating failure. Don’t rush. Don’t cut corners. Stay positive. The first thing you must do is choose your materials. Time spent on good material selection will pay dividends. Your ability to go into nature and differentiate between suitable and unsuitable materials is a key factor in determining whether you succeed or fail. Practice with species you are likely to find in the wild. Some species work well for friction fire-lighting but are scarce in the wild or not widely distributed, common only in small areas. One example is Horse Chestnut (Aesculus hippocastanum), common to parks and roadsides where they are typically planted but, outside of their native range in northern Greece and Albania, are generally not naturalised. Finding one in a wilderness survival situation would be unlikely. Better to practice with woods you are likely to have use of. Treat the temptation to practice with pieces of wood you have at home -old furniture, pallets and the like – similarly. You won’t find much of this in the wild. Get used to using what you can find in nature. 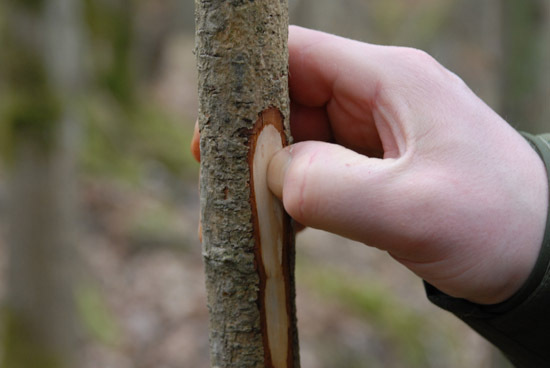 I recommend training with Willow (Salix), Alder (Alnus), Birch (Betula) and Maple (Acer) species. This creates familiarity with species that are relatively common and easy to identify. Willows especially are widespread. Once you have good technique, adding Pine (Pinus), Spruce (Picea) and even Juniper (Juniperus) species to your repertoire means you will have familiar materials to hand at higher elevations and high latitudes, when you can no longer find other species. The spindle and hearth of your bow-drill set must be made from dead, dry, standing wood. Any moisture in the wood will reduce your chance of success. Make sure you select the driest wood available. The driest dead wood will be upright. Wood at an angle away from upright catches more rain. Wood lying on ground is often damp. The spindle and hearth should be made from the same species of wood, preferably the same piece of wood. It is possible to successfully combine two species but, in increasing the number of variables, you also increase the chance of failure. Remember – keep it simple, stupid (KISS). The wood you choose for your spindle and hearth should be of the correct hardness. Too hard and it will be difficult for you to generate the dust required to make up an ember. Too soft and your set will literally disintegrate as you try to use it. You should be able to make an impression in wood of suitable hardness (the wood itself, not the bark) with your thumbnail. Only just, though. But you shouldn’t have to try so hard that it hurts or you bend your thumbnail. With wood of the correct hardness for bow drill, you should be able to make an impression with your thumbnail. Photo: Emma Hampton. Ideally the bow should be light, stiff and strong. The bow must be wieldy, otherwise it will be awkward to use. The bow should be strong but if it is too heavy, you will be unable to drill with it for long enough. The bow should be slightly curved in one plane. It should flex only a little, otherwise the cord will slip on the drill. Provided it is light, stiff and strong, the species of wood chosen for the bow is unimportant. To determine the length of your bow – put your arm straight out to your side and the length of your bow should be from your finger-tips to your sternum (breast bone). If the bow is too long, it is unwieldy. If it is too short, it is inefficient. 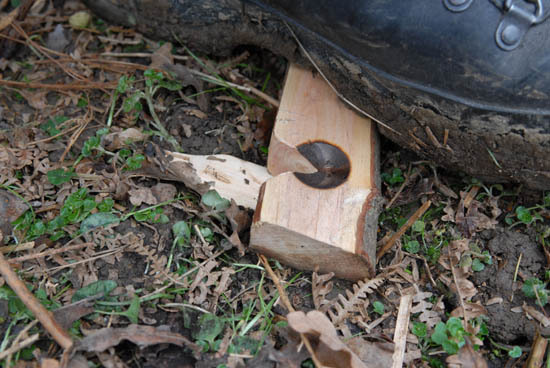 Use the hardest wood you can find for the bearing block. According to ethnographical accounts, some Native Americans would use a rock with a hole drilled in it for their bearing block. You won’t have this luxury when making a bow-dill set for immediate use from scratch. Instead, use the hardest wood you can find. Use green wood for the bearing block. The moisture content of the live wood will help lubricate the bearing and minimise friction where you don’t want it. Collect more tinder than you think you need. Preparation is a vital aspect of successful fire-lighting. This extends to being energetic in collecting plenty of good quality tinder. Remember, successful friction fire-lighting is more than igniting your tinder with your ember. Success also requires you to establish a fire from your burning tinder. In damp conditions you will be glad of having plenty of good, dry tinder to hand. Often, with fibrous tinder, by the time you have rubbed or buffed the material you will have lost a good amount of it as dust. Drying tinder by rubbing on dry clothing or keeping it in your trouser pocket reduces the usable material. When you think you have enough tinder, collect some more. Cordage is the limiting factor. In winter, after plants have withered, when trees are unwilling to give up their bark, and the ground is covered in snow, it may be impossible to improvise cordage. 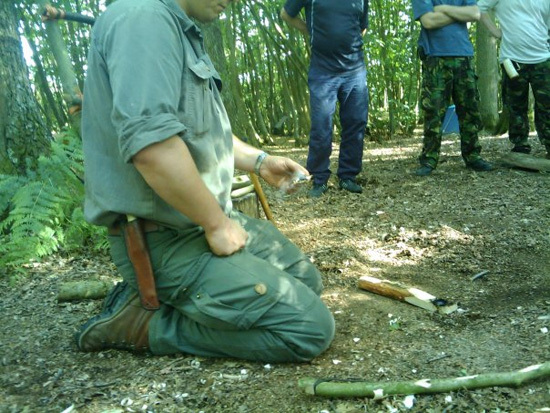 Even when materials are available, successful bow-drilling with cordage improvised from plant fibres is difficult. 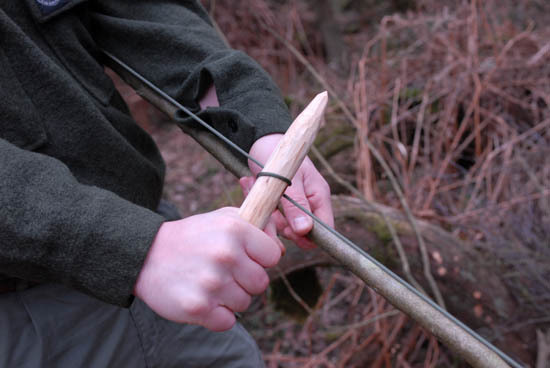 Using improvised cordage narrows the range of woods you can use successfully and your technique must be perfect. In wilderness, you should carry some cordage that can be used for bow-drilling. The traditional material was rawhide or leather. A thong made of this material is durable and grips the spindle very well. Some nylon paracord should be part of your basic equipment as it has many uses. Keep a hank in your pocket. By replacing lanyards, draw-strings and bootlaces with paracord, you’ll always have something you can bow-drill with. When carving the spindle, be particular. Carve a wonky drill and it will not work. The spindle should be 8-10” (20-25 cm) long and dead straight. It can be a bit longer than this if you find it more comfortable but it must be straight. I use the length of my knife as a guide for the length. It should be no more than 1” (2.5 cm) in diameter. Use the thickness of the knuckle where your thumb meets your hand as a guide. Here is the piece I have cut to make my bow drill spindle. I use my knife as a rough measure for how long the drill should be. Photo: Emma Hampton. 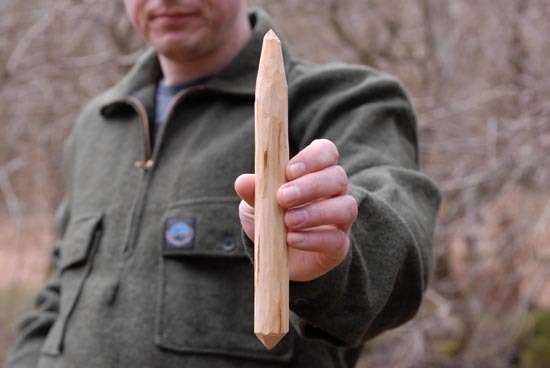 Apart from where you carve a point at its top and a blunt point at its base, your spindle should be the same diameter from one end to the other. The spindle should be round. An oval cross section won’t rotate smoothly in the hearth board. Bow drill spindle - carved to minimise friction at the top and maximise friction at the bottom. Photo: Emma Hampton. The hearth should be no thicker than the diameter of your drill. Your hearth should be 0.75-1.0” (1.9-2.5cm) thick. Too thin and you’ll drill through it too quickly. Too thick and you’ll find it hard to create an ember as the dust cools too much before it consolidates in the notch. Don’t labour on the hearth too much if it’s not necessary. If you plan on using the hearth repeatedly, you should fashion a nice board, like a small floorboard, so you can drill multiple depressions. On the other hand, if you are setting out to make fire as quickly as possible, you don’t need a ‘floorboard’ hearth. To expedite the process all you need do is ensure the hearth sits flat and stable on the ground, then fashion one end so it is the correct thickness and you can drill on it. If your aim is to get a fire going as quickly as possible, carving a perfect ‘floorboard’ hearth is unnecessary. Place your spindle on the outside of the cord. Twist your spindle into the cordage so that the spindle is on the outside of the cord, not between the cord and the bow. This allows the full length of the cord to be utilised. Make sure the cord grips the spindle. When you have twisted your spindle into your bow string, grab the spindle in one hand and your bow in the other and try to slide the spindle up and down the cord. If it slips at this point, it will slip when you are drilling. If it is slipping, remove the spindle, re-tighten the cord then try again. Lubricate the bearing block. Add a small amount of green leaf material or spit into the depression in your bearing block for lubrication. Alternatively, if your face is greasy enough, you can rub the pointed top of the spindle on your face to add extra lubrication. The best place is on either side of your nose. Burn-in your set before you cut the notch. If you cut the notch first, the drill can drift away from the notch as it beds into the hearth. This will cause problems. Bed-in the set first then cut the notch. The set is burnt-in when the depression in the hearth and the whole of the bottom of the drill is black (not brown). You shouldn’t need to go flat-out to burn-in the set. Don’t get too pumped at this stage. Once you start drilling, start off steadily, warming up both yourself and the bow-drill set. Make sure your rhythm is steady and you use the full length of the cord, not just the central portion. The bow should be kept horizontal, moving parallel to the ground. This will keep the cord in the middle of the spindle and help prevent the spindle popping out. The motion should come from your shoulder not the elbow. The notch should be one-eighth of the circle you have drilled into the hearth. The sides of the notch should be smooth and meet at the centre of the circle. Mathematically, you are cutting out a sector of the circle with a central angle of 45 degrees. If the notch is too small, it can be hard to consolidate enough hot dust to form an ember. If the notch is too big, the spindle can easily jump out of the depression. The notch should be one-eighth of the circle you have drilled into the hearth. Photo: Emma Hampton. Cut the notch on the side of the hearth that is nearest to you. This allows you to see the dust gathering in the notch. Cut the notch facing away from you and you won’t see a thing. Now you are ready to make fire! Remember to have the site for your fire prepared and tinder, kindling, and larger fuel ready. Put something under your hearth to catch the dust and hold the ember. A chip of wood or a piece of bark works well. Be comfortable and keep everything steady. If your posture is not comfortable before you start drilling, you certainly won’t be comfortable while drilling hard and this is likely to limit your ability to succeed. Ensure the hearth is held fast by your foot and the forearm of the hand holding the bearing block is clamped against your leg. Failure to keep these things steady usually ends in failure. Again start steadily, warming up with a steady rhythm, using the full length of the cord. You should have an idea of the pressure needed to create smoke from when you burnt-in the set. Long, even strokes with the bow moving parallel to the ground should cause smoke to start rising from the base of your spindle before too long. If not, press a little harder. Once you have smoke and are running smoothly, still using the full length of the cord, go up through the gears, getting faster and faster. Once you have good smoke – thick rather than wispy – coming from the set, 10 more full strokes will be enough to guarantee an ember. Count down from ten. Give it a couple of extra strokes for good measure if you still have it in you. Smooth bowing combined with downward pressure and a steady hand quickly produces smoke, even on a cold, damp day. Photo: Emma Hampton. 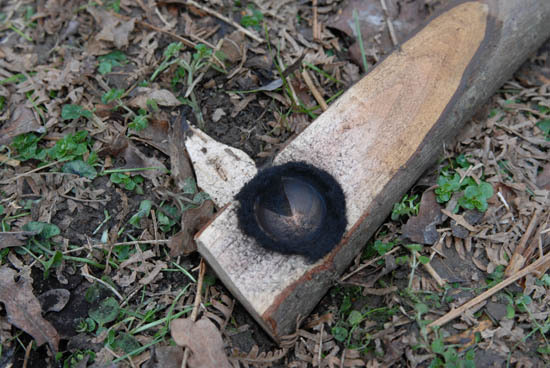 The notch of the bow drill set is full of black dust which is smouldering: an ember has been created. Photo: Emma Hampton. Don’t destroy your ember. Now that you have an ember, don’t destroy it. Carefully tilt the hearth away from you while holding the ember in place with a small, match-stick thin twig if necessary. Protect the ember from drops of rain or sweat. If you are breathing heavily after the effort of drilling, don’t blow the ember away by accident! Carefully lift the wood chip or bark on which the ember sits away from the ground, taking the ember away from the moisture of the ground and damp air closest to it. Don’t blow on the ember. If the ember needs more oxygen, waft it gently with your free hand. Your ember will disintegrate if you put it into your tinder too soon. Allow the ember to consolidate and start to glow before transferring it to your tinder. Here I'm shielding the ember from the wind while I wait for it to consolidate. Photo: Emma Hampton. Your tinder must be dry. It’s not enough to have plenty of good tinder. It must also be dry. You don’t get two-thirds of a fire for getting the process two-thirds right. With fire-lighting you either get full marks or zero. I’ve seen many students fail at this stage until they realise how important dry tinder is. Don’t bury your ember in the middle of your tinder. Place your ember about one-third of the way into your tinder bundle. Pinch the bundle from both sides. The aim is not to smother your ember but keep plenty of tinder in contact with the ember so the ember grows; be firm with it. You must provide oxygen to speed up the combustion. Blow quite firmly into the tinder bundle but not hard like you are blowing out candles. Your mouth shouldn’t be too close to the bundle when you blow as it introduces too much moisture from your breath. About 6-8” (15-20 cm) is good. As the centre of the bundle starts to smoulder, press it all together a bit more to maintain a ‘critical mass’ of heat. The smoke should be increasing. Keep blowing. You can swing the smoking bundle away from your face as you inhale if you want to. Thick, almost green smoke indicates the tinder is about to burst into flames. One more blow should then be enough. Invert the bundle. When your bundle bursts into flame, the flames will be going upwards (as they usually do!). This means the bottom of your tinder bundle won’t be burning. As you place your tinder bundle down onto the site where your fire will soon be established, turn the bundle upside down so that the flames are forced to ignite the previously lower section which is now at the top. Success! I’ve seen many people succeed with bow-drill. The key is to keep trying. The effort will eventually pay off. You can also take some enjoyment from being in the process of learning something that can be difficult to get the hang of. "And finally, I just made fire using only sticks and a piece of string..." Picture courtesy of Will Tarran. When you have to rely on the technique, there are no points for trying. In a survival situation there are no separate grades for effort and achievement. This is when your training and practice really pay dividends. If you are on your own, you have no choice but to employ bow-drill technique as an individual. If you have someone with you, double up and use the power of two people: one on each end of the bow, both steadying the bearing block. Even if you are with someone who has never used the technique before, you can direct them to drive the bow back and forth from the other end of the bow while you drill as per normal. You can achieve an ember like this even when tired and hungry and you would have had difficulty on your own. I’ve observed individuals on advanced courses fail while two team-mates looked on. Not until they worked as a team did they crack it. Don’t let your ego get in the way. As the last point in the above list suggests, the main obstacle to success with bow-drill is lack of belief. You have to believe you can do it. You should set out with the mindset that success is inevitable. If not, then why try? An ember won’t happen by accident. You have to make it happen. If you’ve never achieved an ember on your own, this can be difficult to believe. Then persistence is your key ally. Don’t give up! It takes a while to get everything right but it will come. It is possible to learn this technique on your own but getting quality instruction will speed things up considerably. I struggled with bow-drill at first but once I’d practiced and attained the right mental attitude it was as if someone had flicked a switch from ‘hard’ to ‘easy’. Eventually, if you practice enough, you will find bow-drill fire-lighting easy. It would be great to learn about your experiences with this technique. Leave a comment and let us know your high points, low points and any tips you might have for others that are learning the technique. Have you had to rely on this technique in a difficult situation? Good detailed descriptions but could use a few close up pictures or diagrams to illustrate the points. I’ve gotten lots of smoke and heat in the past, but no embers to capitalize on. I’ll give it another go. Thanks. You are not the only person to have asked for more pictures! I’ve had a few emails to this effect today. It seems I was wrong when I wrote this article. I assumed that people were happy that the basics were covered in various books. My aim was to help people along with more detail and tips based on having taught this technique to lots of people and seeing where they make mistakes and get stuck. I thought that if I included the basics people would think I was re-hashing what was already out there. This feedback is great though – I’m learning too. It seems like comprehensive, in-depth articles covering the basics and the advanced detail is what people are after. That’s great! Thaks for your feedback Ken. It will only help this blog get better. In the meantime good luck with your bow-drilling and let me know how you get on. Your blog is a great source of inspiration. I am enjoying reading your advice and pointers. This particular post is very helpful, it goes much further than any of the books I have read. Some step by step photos would be very helpful. Good to hear from you. It’s great you are enjoying my blog. I’m glad you like the detail but again, you’ve added to the consensus that I needed to add more photos! I’ll write a companion article in the coming weeks that will address this. Thanks for your feedback Matt, I really appreciate it. This is the first article that i have read of yours, and so far i am quite impressed with the levelof detail that you publish. As has been said prior to me a few pictures would not go amiss. Great site. 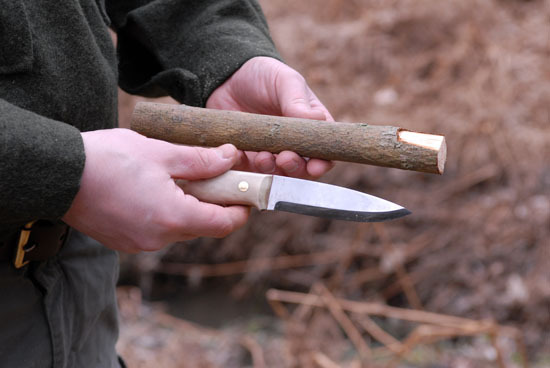 A fascinating subject and as you say it is deemed a core skill or benchmark for Bushcrafters. The learning , understanding and development of the skill can be mirrored in many of the Bushcraft skill sets.It appears to me even when you think you know how to do something ,unless you’ve done it a hundred times in many different scenarios, it may not be second nature and success is not always inevitable. If many students or followers of the subject are anything like me , you can never get enough information about the detail and understanding the ‘little nonces’ that make something work for one person and not another.It certainly is always the beauty of being taught as opposed to reading about skills and trying to self teach.Invariably the teacher passes on those valuable tips and clues which make all the difference between success and failure. 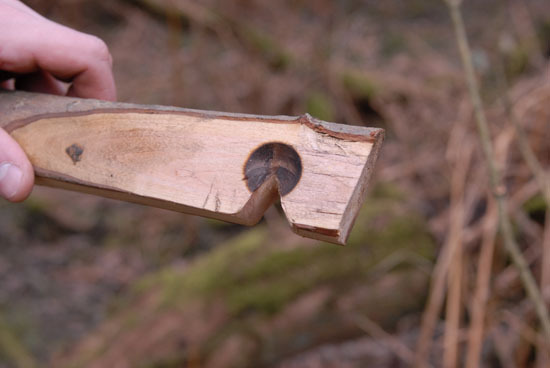 I am always bemused to see people with really well honed Wilderness living skills do very little work towards producing a Bowdrill set (the sets look very rustic,almost untouched) and yet achieve an ember relatively easily, espeically when using just Stone age tools. When I will stuggle with a well made, pleasing to the eye to set. It leads me to think the process is more about technique & wood selection rather than precise components ? Personally my own success with Bowdrill is a little limited .I tend nine times out of ten to light fires with a means I am100% confident with relative to weather conditions and time constraints.I use bowdrill occasionally and will tend to ‘set it up’ so there is always a good result . Some skills I am happy to keep on trying and perfecting to banish the possibility of defeat.But with Bowdrill I need a lot more determination in avoiding’ the easy route’ and trying to perfect it in most situations. Thanks Paul another great article. The more photos the better. Joseph harvey great comment about the ear wax I aways combine mine with some bellybutton fluff. 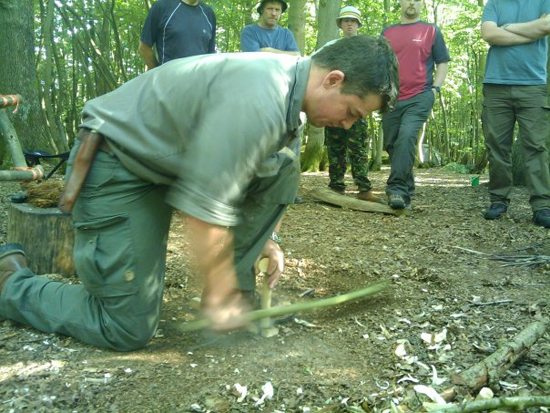 Great article, I first learnt friction fire lighting using the Bowdrill under your instruction while on the Fundermental bushcraft course back in 2008. After much practise I was able to make fire. I kept the the set I made and after reading this I feel that I should get it out again and start practising. Great site and lots of helpful information. Great to hear from you. I reckon you should definitely dust off your set and have a go with it. Maybe even make a new set from scratch! 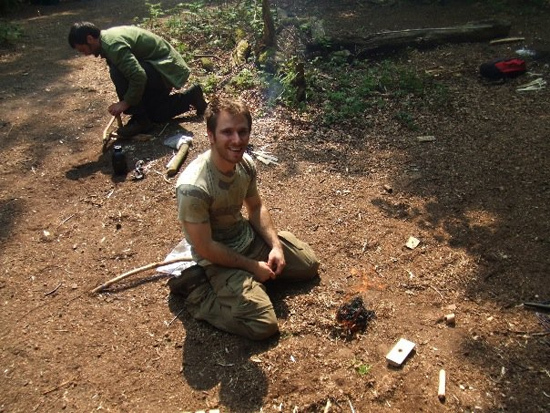 I was on the course where those photos were taken; “Introduction to Bushcraft 2009” if I remember. I must have been sitting next to the photographer. I am involved in a project working with youngsters, and I have just recently succeeded with my own bow drill set, after a bit of trial and error. I wish I’d found your blog earlier! Good luck with the venture and thanks for what you inspired in me. Great to hear from you! I remember that course well. You were a really good group. Best of luck for the project with youngsters. It was an excellent course and as you rightly remember, a good group. Every time I set foot on the woodland site I’m involved with now I have “happy flashbacks” to that weekend. Super article. Easy to read and inspiring. One aspect that is less covered and that was critical for me is the actual body position. I found this video from Practical primitive the best: http://www.youtube.com/watch?v=PlxujVPiN6U. It also emphasizes that technique, not strength is the key. Before I got my first ember I sometimes drilled to exhaustion. When I finally got it right I discovered it actually goes fast and with moderate effort. Thanks for your comment. That’s a good video demonstrating the importance of posture. It’s nice that what says agrees with what is in my article! 🙂 I particularly like that it is a woman demonstrating. I’ve found that women often at first don’t believe they can succeed with bow-drill because they think it is about brute strength. It clearly isn’t. firstly I want to thank you for showing me the skillls required for making fire by friction, as I have all ready said earlier in the comments you did this back in 2008. Any way I have just had the best afternoon passing this skill onto my two small children and Father in law who is a Scout leader of 30+ years. He has never done this and wants to show his group something new. So after a several goes we had the ember required to get small fire going that we soon turned into an afternoon of fueling it while sitting drinking tea. A fantastic afternoon and a great feeling to know that I have retained the knowledge and skills to be able to create fire from nothing more that some wood, a piece of string and alot of effort. and tried to grasp the art of ﬁre. and trimmed it with a knife. And hot smoke breathed upwards. and ﬁresticks for making it. of blazing ﬁre into the distance. This is from The Homeric Hymn to Hermes, written circa 700 BCE – you can see the whole hymn at http://www.julescashford.com or get it in Penguin Classics. Hermes, of course, was the god of journeys, and ‘herms’ – small cairns of piled-up rocks, originally – marked the location of springs. So altogether, very appropriate for Bushcraft! For me personally the most important thing is not to start with too much intense and force, depending on the matarial you have it might take short, it might take a bit longer. Focus on creating “the dust” and if enough increase speed and if needed vertical force, to intensive the heat production which eventually should turn it into an ember. The muscle groups you use are not used to the properties of this movement and might “cramp up” if you overstrain them in a too early stage. Also, watch your breathing since you are in a posture which does tends to give you a little less air. As for using the bow drill to start fire. We lived out in the wilderness in the North Cascades last year and most days we had to light a fire using this method. We were living as stone age people, our clothes were all made from Buckskins, all our tools from bone stone and wood. Food was foraged and hunted using bow and stone tipped arrows. We had dried meats that we had processed from a buffalo before we set out. It was quite challenging after a 7 hour walk (as we were nomadic) in bare feet with big blanket packs or burden baskets to light a fire! But we had to no giving up no matter how tired and hungry we were. The key to success is persistance and repetition. Your technique becomes some refined that you can seem to light fire with almost any wood. When you learn how to light a fire by friction or learn any new skill teach it to someone else and you’ll find it goes in better. Thanks for sharing your experience. When you have to rely on a skill it certainly focuses your mind and increases your determination to succeed. I agree about teaching a skill too – in teaching it you have to deconstruct and analyse what it is you are teaching. This increases your understanding further. Your adventure in the North Cascades must have been a wonderful, life-affirming journey. The pictures of your group in the link you sent to me definitely gave me this impression. I think your pictures would also interest other readers here too, so I’m posting it here…. Lighting a fire with bow and drill is the bushcraft skill I’m less confident with, I have tried a lot of times with few satisfying results. I have found some great suggestions reading the material selection to correct my mistakes (I think I have always used wood TOO dry just to say the biggest one). What I find really useful in articles like these, apart from a good basic description of the technique, are the advanced tips or common mistakes description, that sometimes are the the gap to fill in order to a achieve good results (once you got the basics). Good to hear from you and I’m glad I pointed this article out to you. I hope you can use it to trouble-shoot your bow-drilling and that you build up to achieving consistent results and, therefore, greater confidence. Let us know how you get on. Good luck! Very inspiring – the new photos are very useful. One of my main aims between now and September is to make Bow drill a second nature skill.Thank you for this excellent article. Thanks for your comment. Kind words indeed! As I said before, I really enjoy reading your style of writing, this article in particular is brilliant, many thanks Paul! When I researched bow drill technique I found that most, if not all, tutorials suggest the heath should only be a little wider than the drill and yet yours seems quite wide. It obviously works for you but I just wondered about your thoughts on this. Willow and Willow for me by the way! Good question! Yes, I’ve read this too. If you think about the physics of what you are doing, however, the expanse of wood outside of the area that is in contact with the bottom of the spindle makes no difference. At least not to the efficacy of generating friction and the actual mechanism of making an ember. A wide hearth board – an I’m talking wider than I generally make them – does have a larger footprint and so is less likely to sink into soft ground or compacted snow. In cold environments, it can be advantageous to make a wider hearth board. There is a method of making a wide hearth board with an integral ‘step’ that acts as an ember pan, thus keeping the dust and ember away from damp/cold ground completely. Indeed, records exist of native peoples in Alaska doing just this. This doesn’t change the mechanics of making an ember as long as the dimensions of the drill and thickness of the hearth remain unchanged. The thickness of the hearth certainly makes a difference though, and this is mentioned in my article. Where the width of the hearth does make a difference is in how long it takes to make the board. If you start with smaller diameter material and make a board only a little wider than the drill then you have less carving to do. This can save some time and effort in making the set. I finally got the bow-drill to work last week and was very proud of myself! This was after a couple of weeks of trying and a little help from my boss! (there aren’t many jobs where you can practice this and call it work!). We then went on to teach a group of children how to do it, and although many of them did not have the strength to get it to work their motion and technique was good, so hopefully some time in the future they will have success with the bow drill – the parents who did were very pleased with themselves! – but the children I worked with were very pleased with mastering the flint and steel. (and I think all of the kids would have slept well afterwards too!). Thanks for all of the advice and tips you give on here. As a bushcraft beginner who has been trying to get better for the last two years the discovery of this blog has been invaluable, so thank you! Thanks for your comment – it’s good to hear what you’ve been up to recently, particularly with friction fire-lighting. Great that you’ve had some success! It sounds like you have a great work enviroment 🙂 Thanks for letting me know I was able to help in some small way. There’s another thing that I’ve thought of that folk might concur with (and I don’t think has been mentioned). Don’t try it after a meal! I did when I was giving my first ever demo to a Cub pack and the cramped position made it very hard with food inside me…I knocked out smoke for them but had to give in. This was a reason why I let the skill slip for a while. As an alternative to a bow drill, have you ever used a pump drill? I’ve just finished a project to learn about and make one and it’s a very efficient tool, also being easier to use as far as technique goes. It is more of a static camp kit than something to make on the move but it was a real education understanding how to make it work. Regarding Mark’s early comment about rough and ready sets, I was initially taught to make the set to exact dimensions but have since become much less rigourous (or just lazy). The condition of the hearth has made little difference to me providing it sits flat, even to the extent of two simple splits with an axe or batoned knife either side of the heart of a sawn length of branch. If it sits flat and is roughly the right depth, it’ll go. As for the spindle/drill – the rougher the better – beautifully round means far more likelyhood of slippage. Give it some edges to grip! I was intrigued to see Ray using a doubled cord in the video, increasing the grip on the spindle. Definitely giving that a try, as well as using the knuckle measurement for future pieces – a handy tip I will be taking away. Yes, agreed, as long as it sits flat and is the right quality and thickness, you don’t need a perfect floorboard for a hearth. If the spindle is too smooth it may slip, but in my experience of teaching people this technique, unless you specify smooth, people make it too lumpy and this causes some vibration problems. Many small edges is best in my experience. i like this blog about using a fire drill . i am working on a blog about prepping and survival too ….. Welcome and thanks for your message. I’m glad you like my blog. Good luck with your bow-drill and please do let me know how you get on. Hi Paul, brilliantly informative and useful article as usual. I struggled with bow drill for a long time in the end Ross Bowyer sorted my technique out and I cracked it. I’ve recently started experimenting more with mixed woods, current weapon of choice is a ivy or lime hearth board with a hazel spindle. Seems to work really well. Another great read though mate. Just been trying to nail this bad boy on my own for the past few weeks using Birch materials, but no luck so far and it’s the 4th weekend running! Lots of smoke produced and I keep drilling for a while once the smoke appears, but it just doesn’t seem to collect and ember (glow) ….. Dmoke is black and powdery, which I understand to be the correct consistency, but it won’t glow! Help! My pleasure Chris. Thank you for your feedback. smothered it. However this is one skill I’m determined to master so when I go camping in the lakes next week I will try again. Good work Paul very good detail here. Just a little trick I use is when I’ve made my set is to stop, pause for a minute, calm myself and then get focused on just the task in hand. I know it sounds draft but I find a calm mind and a relaxed body make for better results. Any thoughts on this? Yes, I think there is a lot of validity in taking the approach you do. It’s all too easy to go in hell for leather yet be off kilter from the start. One female instructor that used to work with us, would calmly warm the set up after cutting the notch, building up some dust in the notch. She’d then take a breather, calm herself and then make the final push to create an ember. While part of the benefit of the break was a physical one, I also think it helped remove the pressure that one is apt to put on oneself, allowing her then to just focus on achieving success. Hi Paul and fellow bloggers. I too took a long time to crack this, many days in the woods sweating like a pig and sounds like a wounded donkey emanating from my camp surrounded by many frayed and broken chords . I will always remember that first time I was successful, kneeling there looking at my tinder bundle in flames in disbelief thinking “did I just do that?”. It’s a long time ago now and many fires have been started this way but it still makes me smile every time I do it. The memory of that first sucess and that feeling of accomplishment will stay with me forever. I feel that this skill has taught me the importance of never giveing in and to have faith in myself and my skills. That sounds like hand-drill rather than bow-drill then. Hand-drill is a lovely, elegant method of firelighting as long as you have he right source materials. Bow-drill, however, is more widely applicable, and works better in the damp of the northern temperate and boreal zones due to the greater mechanical advantage you achieve. I’m relatively new to this and love your videos and blog they have helped me learn fantastic skills!! However this bow drill lark is so far beating me!! Every time I’m just about to get ember my cordage breaks!!! have I bought cheap rubbish (ebay) or is it something I’m doing ??? Any answers would be marvellous!!! Keep up the great work Phil. I really liked you’re demo on bow drilling. Over the years I’ve had a go at it but I keep getting a recurring problem. I seem to get a polishing effect on the drill tip and hearth instead of any real heat or dust despite a good sustained rhythm. I carved the drill from what I thought was a dead and dry branch and created a hearth by double spiting a dry log. Both were Norwegian spruce. Can you advice on what’s causing that? Such a great site and another great lesson! Thanks for the feedback Robert. You are very welcome. Great read this Paul it has certainly pointed out some of my weaknesses, it just makes me even more determined to master this technique! I can’t thank you enough for such detailed informative material for free great work thank you Stephen. Just got my very first coal thanks to this blog. I’ve known the general idea of bow drilling but once I got onto this blog, it put right all those niggly things I wasn’t getting quite right. And now I’ve got my first coal. “HAPPY” isn’t even the word, right now. Great blog, brilliant info. I’ve got this site saved in my favourite menu now. I’ve been trying to get consistent with the bow drill for the last few months. I’ve made fire about a dozen times but I’m still at about a 60% success rate. I’ve changed quite a few things and it has certainly helped but I’ve noticed that I consistently fail to burn in my set completely before carving the notch. I never paid much attention to this but I think it is the missing piece of the puzzle. I seem to only burn in about half of the end of the spindle. I goes black and produces some smoke and then I stop and start carving the notch. I think this is my problem. I have been trying to get the whole end to burn in but it takes too much energy. I’m using dried Ivy for spindle and hearth. I can just about make a small indentation in it with my nail. What could be wrong? why is burning the whole of the spindle bottom proving so hard? I did dry the wood out on a heater for days..
I’ve just noticed that the surface of the hearth board is not smooth. The grain is ridged. There are no knots but there is quite a pronounced ridged grain running along the suface. Could this be the cause? Sorry to keep discussing my bow drill struggles Paul but I think I’ve finally understood what I’ve been doing wrong. I spoke to Keith Whitehead at Woodlore and he agreed that this is most likely why I can’t fully burn in my set. I cut a section of living Ivy and then dried it out to make my hearth and drill. I am able to make small nail impressions in the wood but they’re barely noticeable. So the wood is just too hard. I should have used dead wood which would have been softer. I thought moisture would be the only problem I’d have to overcome in using green wood. I obviously didn’t consider how dense living wood can be. Great article on bow and drill. 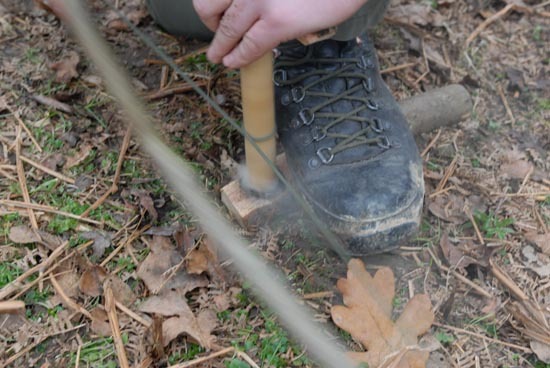 Tried this with the scouts and hope to try it againa in September when we start again after the summer recess, only problem is: we only manged to get smoke and brown powder, walking around our local wooded area we cannot find standing deadwood so what do you do then other than use green wood? If you make a hearth board which is somewhat like a floorboard – of even thickness and width along its whole length, then you will be able to drill several times into the board before it needs to be replaced. For a typical size, which allows you to fit your foot onto the board, you will get maybe four holes in one board. Clearly, the longer the board, the more holes you will fit. With the spindle, it will start off a length which is comfortable and relatively easy for you to hold in position and stabilise. As the drill wears down, it will become harder to stabilise, to a point where, ultimately, you will be better off making a new one. If you choose a spindle and hearth board of hardness which is roughly equal, then they will wear roughly equally, with the spindle shortening in length by the depth of the board each time you drill through it (and the board will be of a thickness approximately equal to the diameter of the drill). This does not, however, take into consideration the possibility of you having to re-shape the top of the spindle once, or even several times, during the course of use. This will shorten the spindle also. So, I would say, while you may get four holes from one hearth, your spindle may not last long enough to drill all of these holes, depending on the consistency of the spindle wood, the hardness of the bearing block and the efficiency of your technique. As a general rule, I would say you should expect to get two decent sized embers from each hole, three if you are lucky. Great article as usual, full of detailed tips. 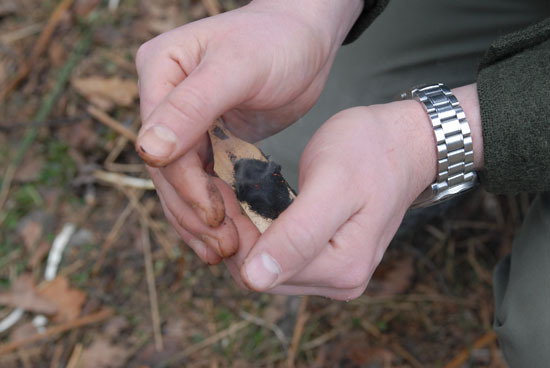 I find the friction fire methods to be the most rewarding activities in Bushcraft. Its been a while since I have been on hear. Some may laugh and scoff at this but in 8 years of practicing bushcraft skills I have never been able to make fire by friction, until this morning! I would be using the wrong wood, green wood, wrong techneque, wrong tinder, not enough tinder, dropping the ember and running out of steam mid way. But after reading this article all seemed to drop in to place. I used a wind blown branch off a lime tree for the set I used the inner bark for tinder and even used its leafs in the bearing block. At first I thought it was a fluke I was so happy! so I burnt that set and set about making another and giving it another go and guess what I did it again. I am looking forward to trying this techneque with other woods now. Hi Joe, it’s good to hear from you. And fantastic news! Congratulations on success with the bow drill. I’m really happy to read about your efforts finally paying off. If my article has been of help along the way, then I am very glad too. This is the best feedback I can ever hope for – that I’ve helped someone along the way. Lime is a lovely, silky smooth wood for bow-drill. I’m looking forward to hearing about your successes with other species…. Great article that I will share with my colleagues who are just starting out. I think people are lucky today with the amount of article’s like this and YouTube videos that are great for tips. As you say a morning of Persistence and I had fire. I use an enlarged set at work so its more achievable for the young people i work with to get a good result working together. I recently found that Burning Bush works really well as a spindle with sycamore. Kenny, this is great. Persistence is the key. Fantastic you are sharing skills with young people too. More power to your elbow. this is great to see, I head up a venturer scout company here in Newfoundland and constantly look for things to interest and challeng my scouts in the outdoors and for sure will be directing them to your information and suggesting to them to give it a try. Thanks for your comments. I’m glad you liked this piece and I hope you find it useful for your Scouts too. Please tell them to feel free to leave questions in the comments section if they have them. I’m always happy to help if I can…. My early problems revolved around getting a decent tinder bundle and then I had a string of successes. Then I went back to the same hearth board, spindle and bow and failed repeatedly. At the beginning, I got the ember quite easily, now I just run out of steam first. Great advice and instructions, Paul. My first two attempts created a lot of smoke (very encouraging) but no fire (perplexing). Then I realised the notch was too narrow. As soon as I widened it a little I obtained my first ember easily. Lighting the fire from that was easy. Then. I made a discovery: a friend, who’d missed the event asked me to do it again. This time I placed an old receipt under the hearth board to collect the ember. Quite quickly I produced an ember, which I collected on the old receipt. I picked it off the ground to show my friend. As I dropped it to the ground again it spontaneously burst into flame! The receipt was made of thermal printing paper, very common. It seems to be an excellent form of tinder!